The Arab Music Archiving and Research foundation (AMAR), in collaboration with the Sharjah Art Foundation (SAF), presents “Durūb al-Nagham”. Welcome to a new episode of “Durūb al-Nagham”. 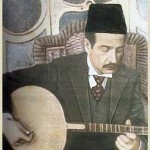 Today we will resume our discussion about Folk Music in Lebanon with Father Dr. Badih el-Hajj. Mr Mustafa, we ended our last episode with “Hayhāt yā bū el-zuluf” of “Abū el-zuluf”. Today, we will tackle another type of Lebanese heritage folk singing that accompanies the most beautiful and happiest celebration, i.e. weddings. Unlike today’s wedding duration that is limited to the wedding evening and the wedding day, weddings in the past lasted a whole week, and even up to 10 to 15 days before that. Depending on the person’s status. Exactly. It depended on the person’s social and financial status, as well as on the town, since towns used to compete: the family of the bride would host the groom’s family, and the latter would want to do the same in return, all in an amicable challenge. Unlike today’s bride and groom who are ready to go right after the hairdresser prepares them, in the past, a song accompanied each action such as: adorning the bride, shaving the groom, tanshīd the groom, the henna of the bride, dressing the bride, tanshīd the bride. The tanshīd means singing hymns praising the qualities of the bride or of the groom. I have audio samples that we unfortunately did not know were tanshīd: the same as women performed zalghūṭa-s (ululation) (♩), men sang a type of ḥawraba. In wartime, ḥawraba was sung for the victorious tribe or army. In weddings, it was dedicated to the groom, i.e. the victor getting married… (♩) This ḥawraba tanshīd that I recorded in Lebanese villages depicts pride and dignity that help the groom feel more joyful and confident to welcome his bride. The social role of the whole village embracing the groom and leading him to his bride is very important. The same applies to the bride, as praising her qualities and her belonging to a noble family helps her build confidence upon meeting with her groom. Let us talk about the jalwa of the bride –which by the way does not mean washing the bride–: It is when they dress her and adorn her face. In some villages, she held a candle and walked in front of everybody in the square where the wedding ceremony was to take place. Jalwa implies luminosity, purity, beauty, and coming to light, i.e. the bride appearing at her best. In the Bekaa, I made recordings of Bedouins or nomadic Arabs who still use the expression “ ‘Arḍ al-‘arūs” (Displaying the Bride): the bride is placed on a podium for people to look at her. The jalwa of the bride was accompanied by songs, zalghūṭa-s and zaghrūda-s.
Now, the next step is when the groom must take the bride from her parents’ house to the wedding venue. Christians used to gather in the village square then go to the Church together. Today, they wait in the wedding venue. Muslims go to the Sheikh for the official marriage ceremony. This was a type of ḥidā’ or ḥawraba. In the South, in Rmēsh, ‘Ayn ibil, and Mārūn al-Rās, it is called mḥōrbeh which means ḥawraba, or ḥidā’ in other regions: the ḥidā’ in Baalbeck is called mḥōrbeh in the South because, according to them, it is exciting and popular…etc. The origin of the word ḥawraba is ḥarb (war) and challenge..etc. It is as if we were watching a recorded movie showing the bride arriving, and the groom arriving, and the people singing. I talked in the beginning about the tanshīd accompanying the bride’s adorning with henna. 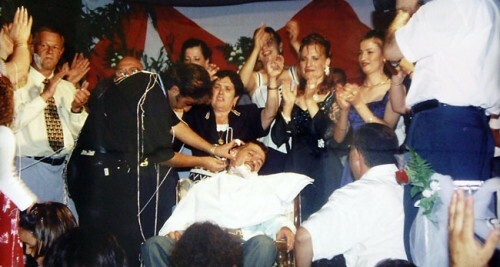 Also, on the wedding evening, the groom is placed on a podium –I have witnessed it– in front of everybody and the barber appointed for this occasion shaves his beard, accompanied by the women’s singing and clapping. There are samples of the singing that accompanies the henna ceremony, such as “Mnēn jibt el ḥinna yā ‘arīs, el-ḥinna min ‘innā, lā el-ḥinna min bārīs” (Where did you bring the henna from? From here. No it is from Paris), illustrating the Lebanese people’s fascination with the west and everything related to western civilisations, such as our admiration for Italian clothes for example. There is also “Ib‘atū la-wlād ‘ammū yjūluh” that stands in lieu of an invitation to the wedding. Inviting people to a wedding was not done with a card and there wasn’t a limited number of invitees: a munādī (caller) appointed by the parents of the groom –usually a relative– passed through the village and invited all the villagers. I witnessed this in Rmēsh: I was making a recording of someone in his house when someone passed under the window announcing: “May joy enter your home. You are all invited on Sunday to X’s wedding that will take place at the pond (Rmēsh has two ponds, an upper pond and a lower pond). I asked him if he was inviting everybody and he answered that the whole village was invited, without exception, including adults and children. Whereas, today, only friends are invited, and mainly older people. So no one dances. 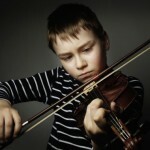 Consequently, we are losing our folklore –music and heritage–, and furthermore by determining the number of invitees because of the financial and social situation, and following the agreement between the two families. A type that is common in the South –we must take the geography’s impact into consideration– is the “Ẓarīf al-ṭūl” that was sung by Wadī‘ al-Ṣāfī among other singers. 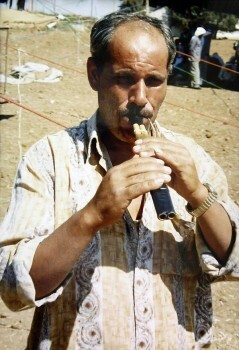 “Ẓarīf al-ṭūl” is not performed throughout Lebanon. I heard it in the South where they acknowledge that it was inspired by the Palestinian traditions and that they played recordings from Palestine during weddings. Furthermore, Palestinians were those who performed in weddings when Lebanon was open. They sang instinctively, and were called to perform in weddings the same as a band would. 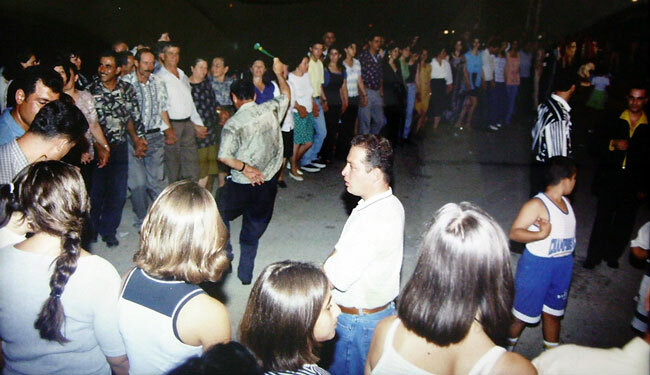 This influenced the singing manner in the region, added to the accent in which the Lebanese heritage is sung around the Southern border of Lebanon, and that is very close to the Palestinian accent. “Ẓarīf al-ṭūl”, that is performed in Jordan and is very widespread in Palestine, is among the famous song types such as our dal‘ōna. We took it from them. I recorded it in the Bekaa where it is performed in a rhythmic style by Bedouins or semi-nomads playing the mijwiz. It often accompanies the dabkeh, just like –or more than– the dal‘ōna. We have reached the end of today’s episode of “Durūb al-Nagham” presented with Father Dr. Badih al-Hajj who told us about the Folk Music specific to wedding ceremonies in Lebanon as well as in other regions in the Levant. We will meet again in a new episode to discuss a new subject.